When you join my email list, you will be kept up to date on my latest art projects and get invitations to shows. Your email will be kept safe and private under the guidelines of GDPR. Please feel free to share my email, website and images with your friends and family. Kathy Morrow Studio - Zazzle Store has many products designed by the artist. Mugs, T-shirts Tote Bags, Key Chains, Night Lights and more. Click the Zazzle button above to see and purchase the products. Subscribe to Kathy Morrow Studio on You Tube and see my videos first. There are now over 95 videos featuring my art and how it was created. Videos include Paintings on Clay Board, Acrylics, sculptures and even the remodeling of our bathroom and patio. Subscribe today if you haven't already. Welcome to my Website and online store. 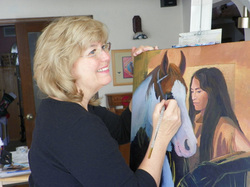 I love to paint a variety of subjects: Native American themes; Wildlife; Western themes with children and Santa; Desert flowers with Hummingbirds; Lions; Tigers; and Bears...Oh MY! I find there is beauty in everything and everyone. All of the people and animals in my art are real and my wild imagination sees stories everywhere. That used to get me in a lot of trouble in school and my Mom saved all the notes from my teachers saying “Kathy is a daydreamer”. Thank Goodness I finally found work where daydreaming paid off! Although, I have formal training in many mediums and paint with Acrylics on canvas in addition to Paintings on Clay Board, my greatest training has come from the School of Hard Knocks. I have spent a lifetime learning through discovery and experimenting with a variety of techniques and materials. Each painting is my teacher. The traditional techniques of black ink on white Clay Board have expanded into full color and then into Kinetic Art. Kinetic art appears to change as the viewer passes by the painting. You will be able to see this as an animation on the Kinetic Art pages. It will be as if you were seeing it at an art show. Enjoy your experience visiting the pages and seeing the art and reading the stories. You may find that you have your own version of a story as well. If you see a painting or print you like, toss it in your shopping cart and Shipping is FREE on orders of $60. or more. Ann & I received your "What's Cooking" in the mail yesterday. We made the "Pumpkin Nut Bread" last night. It was a wonderful evening snack. We'll be making more of your recipes over the coming holidays. Cook Book by Southwest Artist Kathy Morrow. Featuring bread and cake recipes that are Gluten Free and Low Glycemic. Each recipe is paired with art work and the stories that inspired the artist's creations.